Replace your old outlets with these, featuring 1 remotely controlled outlet & 1 outlet that is powered at all times. This smart home product requires your Think Protection alarm system to have the Home Automation upgrade in order to function. For new customers, this can be added when you purchase online. For existing customers give us a call to find out more. 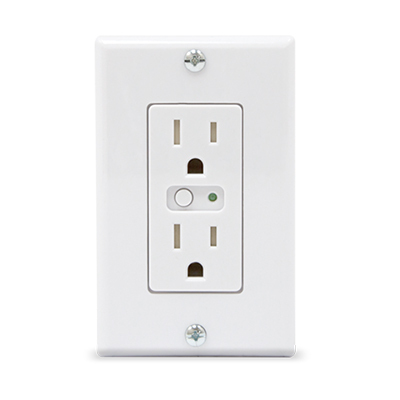 Our Smart Power Outlet allows remote ON/OFF control of loads connected to the bottom outlet (the other outlet remains powered at all times) and is easily wired in place of a standard wall outlet.This device. Set up schedules for your devices & save money with efficient energy management in your home. Making your home a smarter home with these couldn’t be easier! Need to expand your existing Think Protection system?